The reception of Kyiv city mayor was visited by the heads of diplomatic missions from 65 states (with 53 ambassadors among them), the heads of international offices accredited in Ukraine, representatives of commercial and military missions, people’s deputies of Ukraine, representatives of Cabinet of Ministers, Kyiv City National Administration, other invited guests. The project OUTLOOK as the permanent partner of Kyiv City National Administration also visited this even and expressed respect to the head of the city. 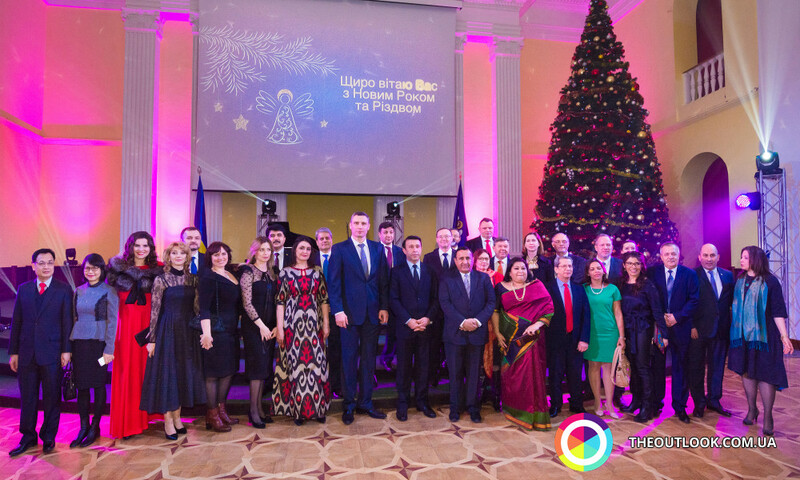 Starting the event, the mayor congratulated everybody who was presented there and noticed that before New Year it is widely accepted to summarize and define the plans for future. ‘I am grateful to all the representatives of diplomatic offices for help, support, belief in Kyiv and its prospects. Let me gratify you for your contribution in those changes that are happening in our city’, Vitaliy Klichko told the representatives of diplomatic corpus. 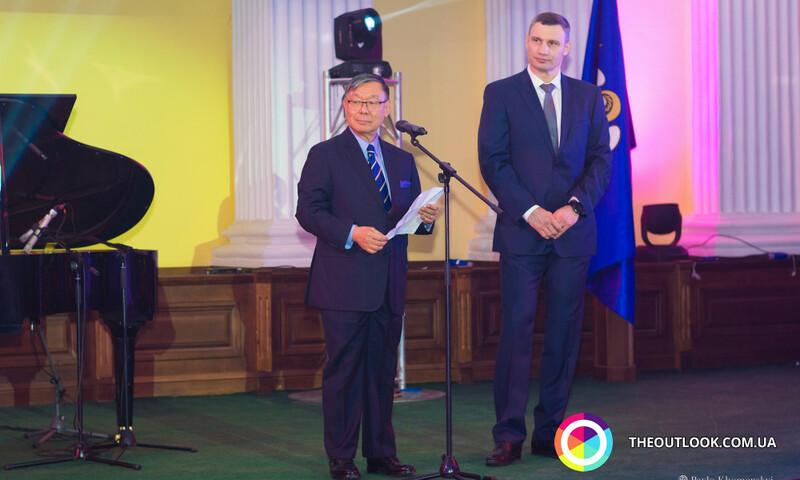 On behalf of diplomatic service at the reception of the mayor of Kyiv the Ambassador Extraordinary and Plenipotentiary of Japan to Ukraine Shigeki Sumi performed because 2017 was announced as the year of Japan in Ukraine. ‘Kyiv is one of the most beautiful and ancient cities in Europe with amazing churches and parks. Kyiv could boast of its cultural and artful activity. Kyiv theater of opera and ballet has casts of international meaning that has been visiting Japan for a year and is well-known for Japanese people’, remarked the Ambassador of Japan. He said that during 2017 acknowledged as the Year of Japan in Ukraine, there were many sakuras planted in Kyiv as well as along all the country. He invited everybody who was presented there at the event that’s going to end up the Year of Japan in Ukraine. It will happen at Sophia Square on the 22-nd of December. ‘I hope everyone will come to see this event and enjoy the festive atmosphere of New Year’, mentioned Shigeki Sumi. Klichko told how Kyiv had been changed this year, particularly, in the city the record 302 kilometers of the roads were renewed, and the new public transport was purchased. ‘The next year we will start the building of new underground stations at Vinogradar. I expect under the auspices of our friends from Germany we will begin the building of Podolsk-Voskresenks bridge so as to embody this important infrastructural project soon. I am happy that Chinese consortium is ready to collaborate in the building of the fourth branch of metro, from Julyny to Troyeschina. It is important for us to get national guarantees from the authority so that Chinese company could come and begin to build quickly’, mentioned Vitaliy Klichko. ‘This year in a decent way and at the high level Kyiv organized Eurovision-2017’. The tourists have seen that our city is the modern European capital with rich history and culture. Now we are ready to organize the finals of Championship League in May 2018. Such a sports event is taken by Ukraine for the first time. We will put all the efforts to make this event at the highest level. I hope in your countries you will promote this event and invite your friends and mates to visit Kyiv during the final of Championship League not only to enjoy football but also to watch our wonderful city. Kyiv is so beautiful in the spring, in May’, said Vitaliy Klichko. Mayor of Kyiv emphasized that today the main dream of every Ukrainian person is to see the peace ruling here, to stop the death of the best patriots who are protecting the independence of our state. Ukraine will become strong and successful country where people might have decent life and benevolence, we hope so.